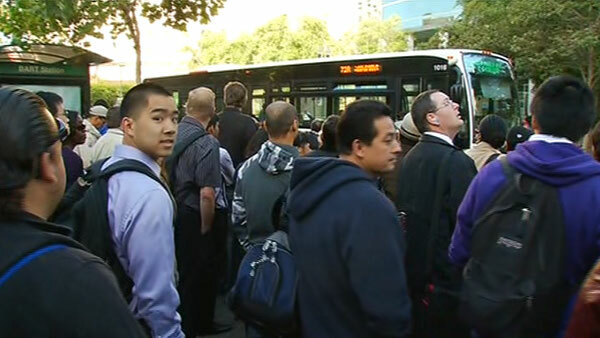 After BART died, AC Transit had to deal with this mess. A massive fire in Oakland blew a hole in yesterday’s commute, shutting down the Transbay Tube and leaving AC Transit and East Bay ferries to pick up the slack. Now, when something goes horribly wrong in the East Bay, Marin will often get a surge of people trying to get to the City, so I expected to hear something out of our local transit agencies. Directions, guidelines, how to go from the two BART stations GGT serves to San Francisco. Instead, I heard crickets. Absolute silence. Located as I am in Washington, DC, I’m forced to comment on what I read rather than on what I hear. I have contacts in a few agencies (and if you ever have a tip make sure to email me at thegreatermarin [at] gmail.com), but for the most part I’m on Twitter and news sites. So when I heard that transbay was down I jumped online to see what the contingency plans were. It was around 6am for the Bay Area, so things were just starting to heat up. AC Transit had been called into service, every ferry in the various East Bay fleets were called up and Golden Gate Transit’s website was overloaded. Clearly there was demand for information and a demand for a better way to cross the Bay. People who are used to BART and AC Transit wouldn’t know how to get to the City without one of those two means of transportation. I stepped in and gave some route information on how to get to SF without using the Bay Bridge, but there wasn’t anything for them directly. The point of a Twitter account, and GGBHTD has three (bridge, bus, and ferry), is to disseminate information in a timely fashion. In Washington, DC, Twitter is a vital link for riders of our subway system and our bus system. Just this past year, the local transit agency began tweeting bus delays. Since the line is manned by an actual person, the agency can answer short questions from riders, activists, and journalists easily. In smaller agencies, Twitter and other channels are used to communicate moved stops, service disruptions, severe delays, and emergency notifications, though they may not be able to afford a full-time social media staffer. Compare this to GGT and Marin Transit. @GGBridge’s last tweet was June 1, @GoldenGateBus’s last tweet was May 22, @GoldenGateFerry’s last tweet was June 13, and @MarinTransit’s last informational tweet was July 29, 2010. This is unacceptable. Marin Transit has ongoing meetings regarding Tiburon’s transit needs and has made major route changes since 2010, while Golden Gate Transit often faces delays and service disruptions as it moves people through the region. If Marin Transit and GGT want to be taken seriously as a viable means of transportation in Marin, it needs to step up its game. When an emergency strikes, they should be ready to provide direction. When there are disruptions, meetings, or route changes, they should make an announcement through all modes of communication available. Anything less does disservice to the system and riders.